One of the real joys of working in the national parks is meeting other rangers, VUA's (Visitor Use Assistants), maintenence staff, and office staff. These are dedicated, committed, and fascinating people. Some are lifers. Some are working in between jobs. Some are at the very beginning of their working careers and enjoying the adventure of moving around the country, and some are at the very end of their working careers and just having fun. At Mesa Verde NP, about a third of the rangers had graduated from college within the last five years, about a third were either retired or very close to retirement, and another third were somewhere in between. And yet, even with the differences in their ages and experiences, differences in political perspectives and presuppositions, and differences in goals and objectives, they all share a common commitment to working in one of our national parks, to protecting and preserving one of American's special places, and to working with all kinds of people from all around the world, and tyring to help them. What many people don't know is that at many parks most of the regular interpretive rangers and VUA's are seasonal workers. 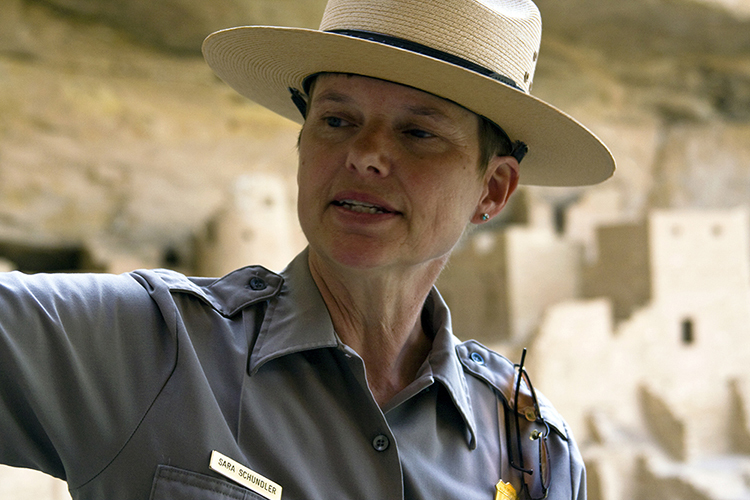 At Mesa Verde NP, for instance, all the rangers and VUA's at the toll booths and the those selling tickets for tours at the visitor center, and all the rangers leading tours and giving evening programs and campfire programs---they are all seasonal workers. And at Mesa Verde, even most of the LE Rangers (Law Enforcement) and many of the bio techs and maintenence staff are seasonal staff. They are amazing people, they work for an hourly wage and no benefits, and they never stop caring! Note: If you have any difficulty downloading or reading these pages, please let me know. Apparenty on some screens, some the the text was running over onto the pictures, and so I have changed the pages in the hope of avoiding this. Please let me know if you have any problems!